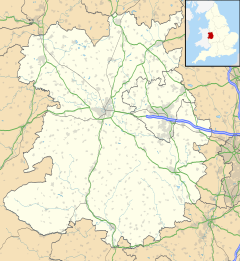 Llanymynech is a village straddling the border between Montgomeryshire/Powys, Wales, and Shropshire, England, about 9 miles (14 km) north of the Welsh town of Welshpool. The name is Welsh for "Church of the Monks". The village is on the banks of the river Vyrnwy, and the Montgomery Canal passes through it. The border runs for the most part along the frontages of the buildings on the east (English) side of the village's main street, with the eastern half of the village in England and the western half in Wales. The Church of England parish church of St Agatha lies just in England, although the entire village lies in the same ecclesiastical parish. The border also passed right through the now closed Lion pub, which had two bars in Shropshire and one in Montgomeryshire. At one time Welsh counties were referred to as "wet" or "dry" depending on whether people could drink in pubs on Sundays. When Montgomeryshire was dry it was legal to drink on Sundays in the two English bars of the Lion but not the Welsh bar. Two of the remaining open pubs in the village are entirely in England and the third is entirely in Wales. Just to the north of the village is Pant. Further north is the English market town of Oswestry. Llanymynech Hill is one of Wales' earliest mining sites. Evidence suggests that copper was mined and smelted here in the late Bronze Age, and that ores were used to make bronze weapons and other implements. The hill above Llanymynech is crowned with an extensive Iron Age hillfort, which extends over 57 hectares, and surrounds a cave opening known as the Ogof. The size of this hillfort is probably explained by the presence of the copper mines. The hillfort would have served as protection for the mine, and housed the labourers employed in the extraction of copper. The Bronze Age British miners would have used fire-setting mining techniques, but with the arrival of the Romans the cavern was extended and more extensively mined. According to the Clwyd Powys Archaeological Trust, before the hill was landscaped for the current golf course, at least ten shafts were visible on the southern part of the hill, together with a large number of shallow pits and shaft-mounds. The main entrance to the mine is still the Ogof. A number of Roman artefacts have been found in the mine including a number of bones and burials, and a hoard of 30 first and second century silver coins of Roman currency found in 1965 by some schoolboys, now conserved at the National Museum of Wales. The mine was probably abandoned c. 200 CE. In early medieval times, Offa's Dyke was built c. 430 and 652, through what is probably the main street in Llanymynech, on the east side of the road. It is thought the west wall of St Agatha's churchyard was built on the raised part of the dyke. Today, the Offa's Dyke Path passes through the village. Under the Normans, the town came under the rule of the Lord of the March (or border counties), and a fortification called Carreghofa Castle was built by the Earl of Shrewsbury around 1101. The place where the castle was probably built, at Tanat Camp, just to the west of Llanymynech Hill and overlooking the Tanat valley, implies it was defending the hill which was being mined for copper and lead, as well as silver. Being situated directly on the borderlands, the castle changed hands between the English and Welsh numerous times during the 12th and 13th centuries. In 1187 the castle was captured by Owain Fychan, prince of Powys, who was then murdered at the castle by his cousins Gwenwynwyn and Cadwallon. In 1194, the castle was recaptured by the English with the purpose of reopening the mines on Llanymynech Hill and extracting silver. Richard I had been captured and held for a ransom of £100,000, and the Bishop of Salisbury, Hubert Walter, heard of the discovery of silver at the Carreghofa Mine on Llanymynech Hill; he decided to develop the mine and reopen the mint at Shrewsbury to refine the silver and make it into coins. Unfortunately, the total amount of silver produced only came to the value of £20, 11 shillings and 11 pence. This mine was located north of the present quarry, and just south of the present golf course clubhouse. In the 1230s, the castle was destroyed and the stones were eventually removed and used to construct nearby Carreghofa Hall. Very little remains of the castle today. The English-Welsh border runs through the village, approximately following the A483 through the village. Therefore, Llanymynech is served by both an English and a Welsh service for everything. Dyfed-Powys Police cover the Welsh side of the village, West Mercia Police cover the English side; Powys Council are responsible for waste collection, recycling, and other council services on the Welsh side, Shropshire Council on the English side, and so on. The English part of the village is in the civil parish of Llanymynech and Pant, and in the electoral ward of Llanymynech in Shropshire. This ward had a population at the 2011 census of 3,988. The 2011 census output area covering the English part of the village has a population of 477. The Welsh part of the village is in the community of Carreghofa in Powys. The 2011 census output area covering the Welsh part of the village has a population of 323. Llanymynech hill is now the site of Llanymynech Golf Club perched on top of the cliffs, whose 18-hole course is the only one in Europe to straddle a country border, being partly in England and partly in Wales. The village is home to one of only three remaining Hoffmann kilns in the British Isles, and the only one with a chimney. The kiln at Llanymynech was used for lime burning. The area around the kiln is designated as the Llanymynech Heritage Area. The former limestone quarry which fed the kiln is now the Shropshire Wildlife Trust's Llanymynech Rocks Nature Reserve, and its cliff face is popular with rock climbers. Due to the local lime stone and mineral deposits, Llanymynech became a transport hub. First to arrive was a branch of the Ellesmere Canal, where it joined the eastern section of the Montgomeryshire Canal at Carreghofa. Today the canal is known as the Montgomery Canal, and the section through Llanymynech is isolated, with an 800 metres (2,600 ft) section being navigable to boats. To the north to Pant the canal is dry; to the south the canal is isolated by lowered bridges. A campaign is in hand[when?] to restore the canal to through traffic. The main line of the Oswestry and Newtown Railway (O&NR) arrived from the south in 1860, a later constituent part of the Cambrian Railways. In 1863, the Cambrian completed the construction of the Llanfyllin branch, a railway constructed to enable distribution of minerals in competition with the canal. Stipulated in the authorising Act of Parliament to avoid flat crossing of the existing canal and Tanat Valley Light Railway, bridges had to be constructed to enable operations. The later Potteries, Shrewsbury and North Wales Railway (Potts), which ran to Shrewsbury Abbey, originally ran under the O&NR and the canal to enable the Nantmawr branch for similar mineral extraction purposes. However, after it ran into financial difficulties, the CR took over the Nantmawr branch, agreeing to rebuild the southern end of the Potts so that it now junctioned[clarification needed] through Llanymynech. After failing to junction[clarification needed] with the GWR and the LNWR at Shrewsbury, the S&NR suffered from low traffic and continual financial difficulties, having now also lost its main revenue stream from the Nantmawr branch. Taken over by the GWR under the Railways Act 1921, it was again closed to passengers on 6 November 1933, but remained open as a military freight route until 1960. The CR mainline from Whitchurch to Welshpool (Buttington Junction), via Ellesmere, Whittington, Oswestry and Llanymynech, closed on 18 January 1965 in favour of the more viable Shrewsbury and Hereford Railway route. This also resulted in the closure of the Llanfyllin branch. The Nantmawr branch remained in operation until the 1998, with the track from Oswestry still in place today. Although no railway now serves Llanymynech, both the Cambrian Heritage Railways and the enthusiast-revived TVLR plan to reconnect Llanymynech with their heritage railway schemes. The A483 trunk road is the main road through the centre of Llanymynech. Ivor Spencer-Thomas, inventor who pioneered new farming practices during the 1930s depression. Nathan James Bartram. Successfully secured promotion with Llanymynech FC to the JT Hughes Montgomeryshire 1st division. Llanymynech Football was reformed in 2011. They currently compete in the Montgomeryshire Football League Division 1 after being promoted from the Football League Division 2 and the end of the 14/15 Season finishing as runners up behind Morda United. They place their home games at Station Road and play in a kit consisting of red shirt, white shorts and red and white hooped socks. They are currently managed by Josh Hayward with Callum Whyte as Assistant Manager. ^ "Civil Parish population 2011". Retrieved 27 November 2015. ^ Wilcock, John. "Llanymynech Copper Mines". Understanding pre-industrial structures in rural and mining landscapes. European Cooperation in the Field of Scientific and Technical Research. Archived from the original on 7 January 2014. Retrieved 23 October 2013. ^ Davies, John (2007) . A History of Wales. London: Penguin Books. p. 18. ISBN 978-0-14-028475-1. ^ a b c d Rhodes, Neil. "Chapter 2: The Romans". On the Border: The Story of Llanymynech and Pant. Neil Rhodes. Archived from the original on 24 October 2013. Retrieved 23 October 2013. ^ Mersey, Daniel. "Carreghoffa Castle". Castles of Wales. Jeffrey L. Thomas. Retrieved 23 October 2013. ^ Davies, John (2007). A history of Wales (Rev. ed., rev. and updated ed.). London: Penguin Books. ISBN 9780140284751. ^ "Ward population 2011". Retrieved 27 November 2015. ^ Services, Good Stuff IT. "Llanymynech E00147247 - UK Census Data 2011". UK Census Data. Retrieved 2018-08-27. ^ Services, Good Stuff IT. "Llandysilio W00002443 - UK Census Data 2011". UK Census Data. Retrieved 2018-08-27. ^ "Llanymynech Golf Club – Tee off in Wales – Putt out in England !!". llanymynechgolfclub.co.uk. Retrieved 2017-03-29. Wikimedia Commons has media related to Llanymynech.